Adventuring in My New Inflatable Whitewater River Raft. HomeBoatsToGo - Blog About Inflatable Boats, Inflatable Rafts, Inflatable Kayaks And More...Adventuring in My New Inflatable Whitewater River Raft. Ever since we were old enough to walk, my brother and I would get into all sorts of adventures together. From wandering away from our parents in public, to climbing any tree we could wrap our arms and legs around, to skateboarding over ramps, we just loved to explore and experience what life had to offer. As we started to mature, so did our taste in adventuring. Eventually, we found one particular activity that we both loved enough to focus on. This was whitewater rafting. From the moment we hit our first rapids on a family trip to the Colorado River a few years ago, we both knew this would be a passion we could share for a long time. As soon as that family trip was done, the two of us booked a more adventurous whitewater rafting trip a few months later. After that, we knew we didn’t want to rent boats any longer. What we wanted was a boat of our own so we could get used to our own gear, and also save money over the long haul on the cost of boat rentals. After much research, we decided to go with a Saturn inflatable raft from BoatsToGo.com. There were a few different models to choose from, all of which provided some great advantages when it came to adventuring. 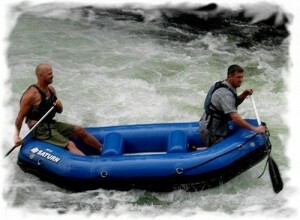 For starters, these inflatable boats were built strong enough to handle some pretty intense rapids. Made out of a heavy-duty 1100 High Strength PVC coated fabric, any Saturn inflatable raft we chose would be very resistant to abrasion, tearing, and puncture. That was important to us, since we were planning to eventually get into some pretty intense adventuring. My brother and I spent a lot of time discussing all of our options, and eventually settled on the Saturn RD290 9.6’ Inflatable Raft. This inflatable boat was the perfect size for the two of us. The lightweight design results in great maneuverability in tight spaces, but still leaves it large and wide enough to handle the Class III+ rapids we were going to tackle. It’s basically a commercial grade whitewater raft, but much less bulky than most of its competitors. Plus, it’s small enough to fit in the trunk of a car or take on a plane for a whitewater rafting trip overseas, and it inflates at the drop of a hat. And if we are looking for the occasional calm day our on the water, the RD290 Inflatable Raft doubles as the perfect fishing boat. Best part is, this inflatable boat was priced at only $899 at BoatsToGo, which fit perfectly into our budget! It’s now been a couple years since we bought ourSaturn inflatable boat. My brother and I have used it countless times, and it has never let us down. The trips we’ve taken have brought us closer together, and I cannot imagine going more than a month without at least a day out in our inflatable raft. We like to joke about how it’s our long-lost third brother, and sometimes it really feels that way. I don’t know what I’d do without it.